So I ended up crashing a wedding at the Schuylkill Country Club. As it was at a more traditional type of place, it ended up being a pretty traditional wedding. No pizza, no ribs, no nacho bar. But there was quite the open bar. Salad and bread. Both of these were actually really great. The rolls were warm and dense. 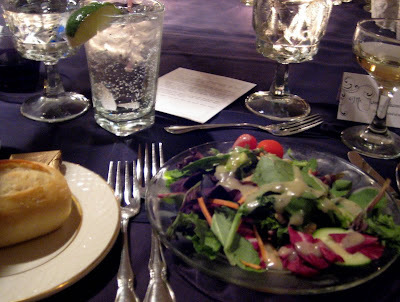 The salad had lovely dressing… slightly mustardy, but still good. 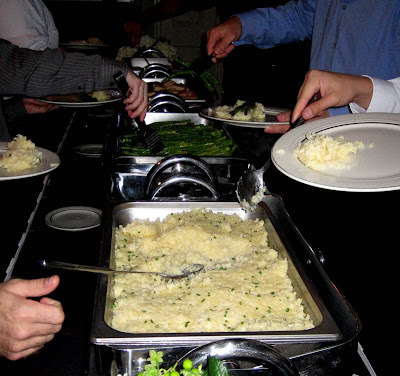 There was no meal selection in the rsvp’s, so it wasn’t surprising that it was a buffet. Although this place was kind of fancy, so it was still a bit surprising. Here’s the rice dish that’s hard to describe. It was like a cross between plain rice pilaf and plain risotto. 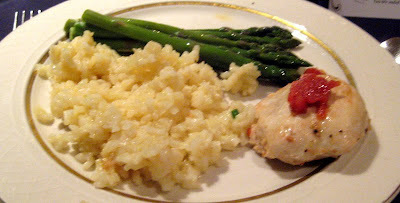 The rice was incredibly mushy, but not in a bad way, so it was like a risotto, but incredibly buttery. So we’re not really sure what it was, but we all really loved it. There was also asparagus, chicken, and salmon. I’m not a big salmon fan, so I just stuck with the chicken and the asparagus, and the mystery rice dish. It’s hard to describe the chicken too, but it was baked, and it was incredibly moist and tender. The asparagus was also cooked quite well and nice and buttery. The meal was quite heavy on the butter. No complaint from me though. I’m all about putting butter on everything. 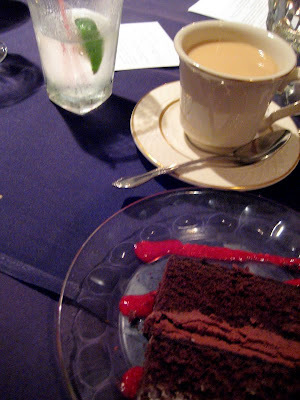 The cake was an incredibly rich and dense chocolate cake with chocolate goop in the middle and some vanilla frosting on top. There was also a raspberry sauce drizzled on it. The sauce was too tart though, so I had to avoid it. I’m not typically a chocolate person, but this cake was quite delicious. I ate the whole thing. I couldn’t help myself. I’m all wedding’d out for the rest of this year!